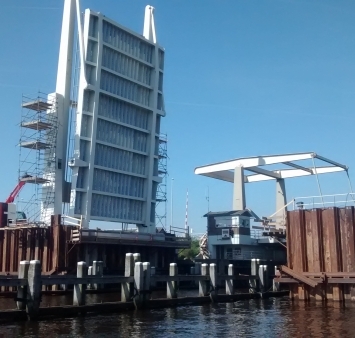 On April 16th, the drawbridge of the Meppelerdiep lock complex was successfully installed next to the existing bridge. The drawbridge is more than 20 meters long, 12,5 meters wide and the mutual weight of all bridge parts is 280 tons. It was transported from Balen to Zwartsluis on April 11th. The bridge was produced at Willems in Balen and transported over the water to Zwartsluis. The bridge is a part of the Meppelerdiep lock complex, which was transformed from guard lock to a lift lock in commission of Rijkswaterstaat. The drawbridge is one of the biggest of its kind. 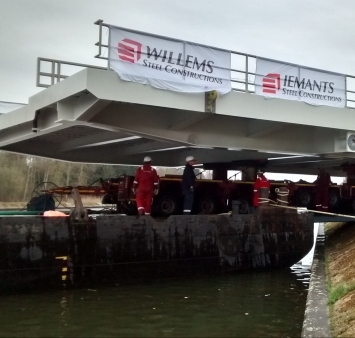 For this project, Iemants and Willems deliver and assemble the two floodgates and the bridge, which will be installed on a temporary location before being installed on their final location two years later.